OurEnergyPolicy.org | Policymaker Support Key to Offshore Wind Prospects in U.S.
Policymaker Support Key to Offshore Wind Prospects in U.S.
Offshore wind is not yet easy to build in the United States. But the question is no longer if a boom will happen, industry stakeholders say, it is when and how it will happen, with policy follow-through a critical component along with improving economics and other factors. While the U.S. had only one of the world’s 111 operating offshore wind projects as of the end of 2016, global developers are still setting up shop. Of the estimated 231,000 MW of potential capacity in the global development pipeline at the end of 2016, 10% is slated for the U.S. Falling prices and new state policies mandating more renewables are the two key reasons that the offshore wind industry is coming to America. But what is responsible for this pending boom? The commissioning of the Block Island Wind Farm gave the domestic industry a significant boost. Additionally, multiple studies have shown that floating offshore wind prices are on the same cost reduction trajectory as fixed offshore wind and that economies of scale will drive prices lower still. Finally, siting and technology advances promise higher productivity. Experts point out that while states have made policy commitments, follow-through is needed so that the market can do its job and ensure a continued pipeline of competitive projects. Actions, such as codifying governor Cuomo’s call for 2.4 GW of offshore wind by 2030 or ensuring the actual implementation of laws such as New Jersey’s 2010 1.1 GW mandate are needed to encourage investors. Market certainty will in turn encourage technological innovation and attract the supply chain necessary to support the growing industry. East Coast conditions are comparable to Northern Europe and can support the developing market but political support is needed. Adapted from an article originally published by UtilityDive on August 30th. 1. What are the barriers to political follow-through and how may they best be addressed? 3. What regulatory reforms should state and federal policymakers consider implementing to support faster development of floating and fixed offshore wind projects? 5 Responses to Policymaker Support Key to Offshore Wind Prospects in U.S.
One has to be cautious about using the Block Island, R.I. experience to support further investments in offshore wind power. First, the five 6 MW wind turbines do not actually provide electricity directly to Block Island. For years electricity on Block Island was provided by expensive and polluting diesel generators. Some Block Islanders sought to have the government of Rhode Island run an underwater electric cable from the mainland to replace the diesel generators, but to no avail. This underwater cable now exists because the huge new wind turbines are only projected to operate around 47% of the time. These wind turbines off of Block Island actually send their electricity to the mainland and their costs are very high , over 24 cents per kilowatt-hour. It would have been far less expensive to have just put in the underwater cable alone. Wikipedia states that the Block Island wind turbines cost $290 million dollars for a nameplate capacity of 30 MW. This results in a capital cost of about $9666/kw, exclusive of the underwater cable, the need for energy storage, and possible new transmission lines. I’ve been told that the Rhode Island Public Service Commission voted against the Block Island project, but were overridden by their Governor. Other states, like New York, are also contemplating off shore wind power. New York’s proposal is some 83 times larger than Block Island, 30 miles offshore vs. 3.8 miles for Block Island, and in deeper water. While some cost reductions are to be expected because of technology advances and large scale production, the case has yet to be made about off-shore wind power being economical. At Block Island capital costs, the much larger NY project, claimed it will be the world’s largest, could cost around $25 billion dollars, and would only provide a few percent of New York’s electricity. Two other areas need to be examined before off-shore wind power is greatly expanded, is their ability to withstand major weather events. These 6 MW off-shore wind turbines are designed to withstand a category 3 hurricane. We just felt the effects of a category 4 hurricane, Harvey, and a category 5 hurricane, Irma, is in the Atlantic now. Hurricane Sandy, which greatly damaged New York and New Jersey, was a category 5 hurricane. The off-shore wind turbines are huge machines, twice the height of the Statue of Liberty, and require special equipment to lift their 400 ton nacelles into place. Some claim that the wind turbines only have a design life of 20-25 years. With their rotor carving out a 150 meter swaths, how much ice can build up on these very long blades before the whole system is overstressed? These issues raises questions about the costs of maintenance of these wind turbines, some 30 miles off shore. Off-shore wind turbines may, eventually, be a major contributor of renewable electricity, but it would be prudent to get answers to the above cost questions and to monitor the performance of Block Island. Today there is only limited experience with such large machines so far off shore. Further, why place these huge machines 30 miles off-shore? Some claim that this is to make them out of sight. This was an issue years ago for some very wealthy people living in Massachusetts who were unhappy with the prospect of having to look at wind turbines as they sailed by in their yachts. Today we still talk about putting large off-shore wind turbines 30 miles offshore for esthetic purposes ( which everyone else will have to pay for) and simultaneously talk about thousands of on-shore wind turbines in plain view and all their transmission lines running near people’s back yards. Why? Offshore Wind has great potential to generate clean energy. The majority of cities are along the coast.and since the wind blows day and night. It is interesting to note #WSJ recognize that clean energy specifically (Wind Power Wins Converts in Rural U.S.) is now the largest wealth and job creation opportunity available to rural America. Technology is changing quickly and offshore will soon be cost competitive with onshore wind. Europe laid the foundation and has made this work the Northeast can benefit from the same progress. Offshore wind development in the US is a lurid example of the triumph of public relations over reality, in a form which severely compromises the real ;prospects for renewable energy and sustainability in the US. Folks like McElroy of Harvard have estimated, in Scientific American that ONSHORE wind in prime areas of the US is capable of meeting the nation’s TOTAL generation needs, at a cost about 7 cents per kwh, while every offshore project I have heard of demands more than 20 cents, batteries not included. A few years back, I asked the PJM representative what the cost would be to ship gigawatts from Texas to East Coast; he quoted 1.8 cents per kwh. When consumers are forced to buy something more than twice as expensive, and far less reliable, the likely impact is simply to shift them to support nonrenewable sources and the enemies of all renewable energy. That’s not speculation; I saw it first hand in the central 2009 climate bill debates in the Senate, where NARUC did more to kill all the bills than anyone else. Anyone who is truly committed to renewable energy, and not to fake games to pander to some base, would give priority to giving FERC full authority to approve interstate transmission lines, the authority it already has for natural gas pipelines. If we had true respect for the interstate commerce clause and for level playing fields, the market and the states could give us a lot more and better than what we see today. I have been an advocate for East Coast offshore wind for 6+ years, East Coast because the continental shelf from Cape Cod to Cape Hatteras has uniquely suited geology for wind power. Shallow, wide and relatively far from shore, the Mid-Atlantic Bight, as that part of continental shelf is called, can produce a substantial portion of the electricity needs of the east coast. The Bight is adjacent to a large portion of our population and the timing of power produced from its wind could meet almost all peak-time demand for Maine to Virginia, all except summer’s highest peak. When combined with solar the wind would synergetically meet all of summer peak demand too. I believe OWE has not yet gotten a play for several reasons, even though years ago the federal government supported the start of offshore farms by working with the states to simplify/expedite the many regulatory regimes with jurisdiction over bringing power ashore. Creating an offshore industry required more than permit smoothing for anyone to build. Because of their size offshore blades must be built close to their destination and because windmills contain 8,000 parts the opportunities for jobs and growth are excellent, but development means essentially building a whole new industry. As the industry develops, prices come down, but there was a chicken and egg problem here. As one developer said .. you can’t build a factory with 1 order. Block Island worked first because its expensive electricity was supplied by diesel. Now that development is underway some analysts think we can expect costs to drop 71% by 2040. Several states have port facilities to build on. I advocated in Virginia where I believe they have missed a big opportunity, one that may be lost because the state’s politicians kept supporting drilling for offshore oil on Virginia’s continental shelf, and because the legislature has not directed the regulatory changes needed to build a new a clean energy economy. Virginia’s primary utility still makes decisions based on old monopoly rules, and has blocked mechanisms to diversify generation ownership. Here is an account of what Maryland is now doing to establish a offshore wind center in the port of Baltimore. “The Maryland Public Service Commission approved two proposals for offshore wind farms off the coast of Ocean City because of economic benefit to the state: approximately 9,700 jobs and $1.8 billion of in-state spending over 20 years. The Public Service Commission required project developers U.S. Wind and Deepwater Wind to build part of their supply chains in Maryland, to spend at least $76 million on steel manufacturing in Maryland, and to use ports in the state. The developers are also required to invest $40 million into Tradepoint Atlantic, a shipyard near Baltimore that was once home to Bethlehem Steel.” The MD PSC put a lot of disparate pieces together. Another misconception in Virginia was to not agree to participate in the proposed underwater grid. 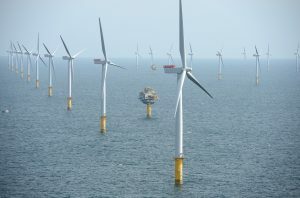 When Dominion won their offshore leases they specified that they would not have to use the proposed underwater connection as proposed by the Atlantic Wind Connection. The project will hook a variety of farms from New Jersey through Virginia with an underwater cable and a limited number of connections bringing the energy ashore. This ‘spine’ will regularize the output of many wind farms and reduce intermittency. “Once it is built, it will be able to move power north to supply power where and when it is needed. This relief of congestion will cause prices to be lowered—it will be adding supply when there is demand,” says an official from the company. It is also an opportunity to upgrade the outdated coastal grid. Other parts of the country are more difficult but the Atlantic Bight is a done deal, I think. Cleveland received the pilot project money Virginia forfeited and is installing 2 windmills on the Great Lakes where winter ice is an issue. Cleveland believes they can move forward with more development with some answers from the pilot project. This ‘medieval’ technology will be an important part of our energy grid soon. These questions are slanted toward the pecuniary interests of suppliers of floating and fixed wind energy facilities. Conveniently skirted by these questions is the question of why politicians should intervene in the market for electric power. Whether politicians should intervene should be the question.